Publisher Hyperbees and developer Rafal Wilinski have already had success with the mobile racing game Voxel Rush. The game has just been upgraded to take advantage of Tegra K1 technology on devices like the Shield Tablet and HP Slate 7 as well as the new Android TV. Nvidia has teamed up with the game maker to sponsor the first ever Platform Wars, starting September 26. Over 100,000 gamers across both Android and iOS devices are expected to race in the event. Tom Mleko, co-founder of HyperBees, talks about the game and this first cross-platform race in this exclusive interview. Platform Wars is a 48-hour in-game event where Android players compete against iOS players, scheduled to start on 26 Sept, 1pm EST. The team with better skill factor wins. Skill equals total score divided by the number of players. Players compete on the same map. The winning team will be rewarded with hard currency. The reward gets bigger with every player joining the event. The event has already been beta-tested and resulted in an increase in player engagement. As one would expect, players found the competition very exciting. The Android side is sponsored by Nvidia and the Android team will get free, Nvidia-branded power-ups. HyperBees, as the publisher, had a clear goal from the very beginning: to create the best minimalist racing experience for mobile devices. The game was planned as free-to-play and we managed to avoid the dreadful “pay-to-win” model. We implemented several new game modes along the way and the players’ community brought many ideas which definitely improved the game. The player races through a minimalist landscape, avoids voxels and tries to survive various in-game events like Tunnel of Death or Earthquake. The game is fast and the experience is enriched further by two great audio tracks. The accelerometer is used for steering because we didn’t want to clutter the screen with on-screen controls. By definition, tablets and smartphones are connected devices and we can focus on multiplayer modes. Players enjoy duels (1 vs. 1), challenges (1 vs. many) and real-time multiplayer. What does your game brings new to the racing genre? 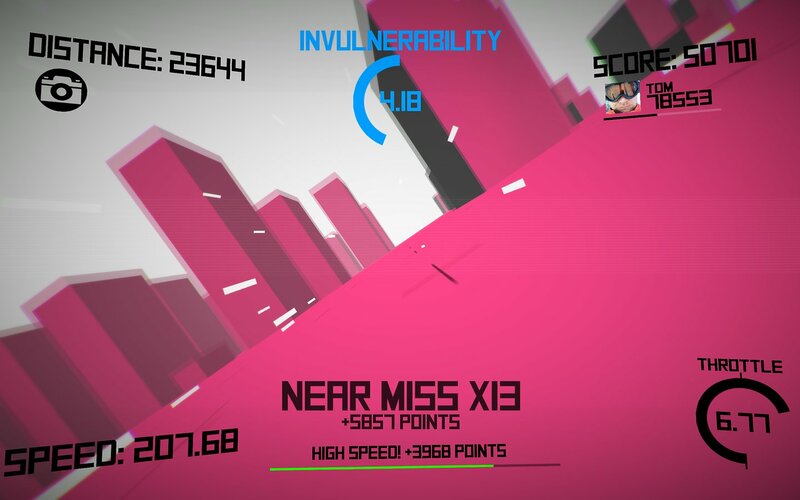 In Voxel Rush players are rewarded for aggressive racing. You get more points if you collect near misses, so bold and risky racing pays off. The last thing we wanted to see was players racing like a 70-year-old granny on her way to get the groceries. We want players to be aggressive, to take risks and push themselves to the limit. What excites you about mobile gaming today? The audience of billions of potential players and the creativity of mobile game developers. Mobile games are the new frontier of gaming today. The majority of the best new ideas come from mobile. We were approached by Nvidia to add controller support to Voxel Rush and make sure that the game works well with Android TV. We got all we wanted from the Nvidia guys, starting with technical help and devices, through fast communication and detailed feedback to marketing support for Voxel Rush. The project was quite intense and the mysterious new device wasn’t available for us to test things on, but we delivered on time and the game was published on Google Play right after Android TV was announced. It was fun. The documentation is good. They were quick with detailed feedback. The turnaround time was counted in hours. We did not encounter any major tech issues. How does your game make use of the latest Tegra technology? The Shield Tablet version of Voxel Rush offers an even better visual experience. Players will enjoy improved UI (user interface) and smoother graphics with new video effects like chromatic aberration, vignetting, motion blur and 32bit display buffer. You can’t get these on a regular smartphone or tablet. Plus, we also made sure that interstitial and video ads do not appear when you play Voxel Rush on Shield or Android TV. I play a lot, and with Shield I play even more, which is the best recommendation you can get. The design is great, the device is very handy and its processing power is very good. The build quality is superb and I really like the way it feels when I use it. The weight and sturdiness make it feel like a device built for more serious gaming. It is certainly a very different experience to play Voxel Rush using joysticks and physical buttons instead of accelerometer and touch screen. It has also changed the way we think about Android-based consoles. So far, most of them were not exactly top-notch when it comes to design, tech and addressable market. Now, with Nvidia coming out with K1, things will change. We all have seen the benchmarks and I just can’t wait to lay my hands on a device with K1 on board. K1 might really push forward the technical side of the business. With better, more immersive graphics the K1 devices could take a significant chunk of the market away from well-established consoles like Xbox. What do you see Tegra K1-powered Android TV gaming opening up for game developers moving forward? K1 could succeed where older mobile consoles failed to deliver: visual experience on par with or close to “serious” consoles. I strongly believe that mobile developers, who are used to fast iterations and shorter development cycles, can quickly offer many high-end games for the K1/Android TV combo. Mobile developers are at an advantage here; they already have a massive audience enjoying their titles on phones and tablets. Now add better graphics, new game modes and a different social context -- at home on the sofa with friends -- and the console world changes. Mobile games are far more accessible than console titles with their casual and price points. Xbox, PlayStation and PC will have a serious competitor. So far, many old-school PC and console developers have sneered at mobile gaming. Now we’ll be competing for the same audience. This is going to be very exciting. One thing that I find really exciting is the ability to play the same game on my TV when at home and then on my mobile device while on the move. No more “companion” games or apps. Imagine continuing a game on your mobile with exactly the same score you had on your big screen when you left home. We already have tech that makes it possible. Voxel Rush is super-charged by Dataspin, our in-house game management platform, and the feature is already there.